Random Film of the Week(end): The Punisher (2004) | "DESTROY ALL FANBOYS!" When I finally got around to seeing the 2004 version of The Punisher last week, I was wondering how I missed this one back then in theaters (although I’d not pay a dime to see this flick) or on cable. Then I realized that the film came out when I was in a crazy jobless phase and had chopped out any ideas of spending money to hit the local theater (or any other theater for that matter) until I was back in the black. Yes, Thomas Jane cuts a fine six-packed figure as Castle in this outing and John Travolta does indeed camp it up as Howard Knight, a cranky crime lord who makes life miserable for Frank (an undercover FBI agent) after Saint’s son is killed in an arms deal gone wrong. Knight’s men assault a Castle family gathering, killing most of Castle’s family including his father (Roy Scheider in an extended cameo), wife (Samantha Mathis) and young son. Frank is caught, allegedly killed by the men and believed to be dead by everyone from his co-workers to Howard Knight, but survives and recovers in a not quite secret location plotting his revenge. The film is pretty by the numbers in most of its influences (other, better revenge films), but manages to pull off a nice little Shakespearian surprise as Castle turns the tables on Knight thanks to capturing Duka,one of his lackeys who dislikes working for the sociopath with the nice suits and ornate living conditions. For someone who’s had most of his family and extended family murdered, Frank’s sense of humor seems more intact than it should be. He “tortures” a blindfolded Duka using a blowtorch (on a steak!) and a popsicle (on Duka’s skin), then somehow makes him a mole in order to concoct a fake affair between Knight’s wife and his key gun for hire/sidekick. One problem with the film is the distinct lack of dialog in some scenes. You see people doing stuff, but not saying much of anything and when they do, it’s going to be short and almost unintelligible or yelled out and making you tap that rewind button. I’d mentioned that the violence in the film is erratic because it’s toned down significantly in some areas and unflinchingly raw in others. The family gathering massacre is pretty TV-ready stuff and even the mowing down of Castle’s wife and child is tame in a weird way. Frank is chasing after the killers on a motorcycle and comes upon their bodies after they’ve been run over, but there’s not a drop of blood or any sign of the truck that did the deed. Just as you’re wondering where the hell the truck went, it comes roaring back down the pier from a seemingly impossible spot, Frank is caught and “killed” in a rather stupid manner that insures he’s coming back in some way later. Once Frank is revealed to still be among the living, Knight sends a few people to try and kill him and of course, they all fail. For some reason, one is a guitar playing Johnny Cash sort of lookalike who dies in an amusing, bloody manner after not killing Castle when he should have. The second attempt is by a big, burly “Russian” muscleman (“pro” wrestler Kevin Nash) in a red striped shirt and blue jeans who busts into Frank’s apartment and beats the crap out of him and most of his place before he finally dies from a broken neck when Frank jumps into him and they both tumble down a flight of stairs. This particular fight goes on for far too long, is set to La donna è mobile and is supposed to be “funny”, but comes off as more Warner Bros. cartoon silly than anything else. It’s also goofy in that before this, we see Frank setting up his place with all sorts of go-to weapons (now of which work on the Russian) and even retrofitting a nice hot rod with metal plates in the windows and other cool stuff. That ride of his gets demolished in a too short car chase sequence that made me laugh because it’s like the one in 2006’s Casino Royale where James Bond’s Aston Martin DBS V12 gets destroyed within about a minute or of hitting the road. So much for all that hard work, I guess. 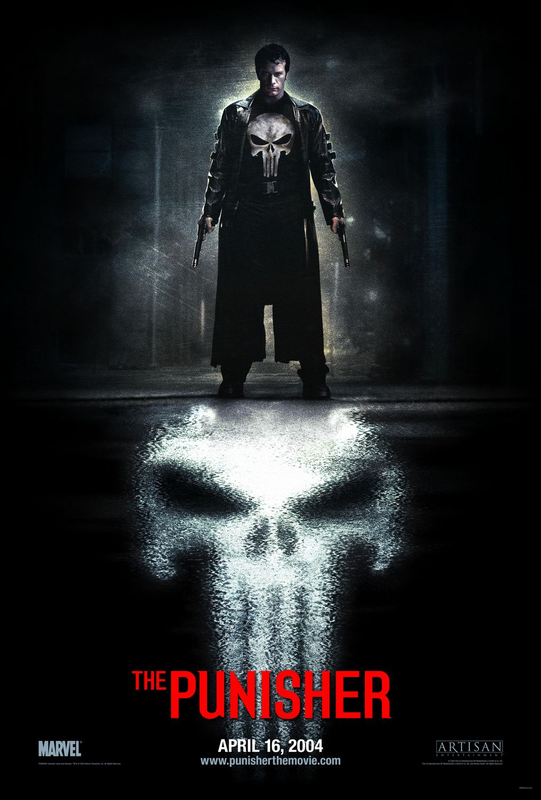 In doing a bit of research, it seems that The Punisher was under-budgeted and things needed to be pared back or cut entirely from the shooting schedule and it certainly shows if you’re looking for anything more than a point to point version of what could have been a better told story. Then again, these types of movies are all about that cathartic release of violence after that spring has been wound as tightly down as it can, and this one delivers on that front once Frank detaches the heavy blade from a paper cutter and uses it on one of Frank’s henchmen (ouch). By this point, a confused and even more pissed off Howard Knight has done in two people he’s trusted who didn’t do anything wrong and by the time Frank gets to him, the body count is all bad men who got what they deserved. Naturally, Knight goes out in the most awesome and hysterical manner (he gets shot, tied to a car’s rear bumper by his ankles, dragged into a fire and then blown up in the resulting explosion! ), Frank goes back to his place and decides to officially become crime’s least best friend. This entry was posted in 2014, Commentary, DAF, Humor, Updates and tagged "B" Movies, 2004, Artisan Entertainment, Bad Movies, Columbia Pictures, Lionsgate Films, Marvel Comics, Marvel Productions, Movie Clips, Movie Posters, Movie Trailers, Random Films, Sony, Sony Pictures, The Punisher (2004), YouTube by geelw. Bookmark the permalink.